Laura and my birthdays were both in the last month, so we decided to jointly celebrate by going to dinner at Sprig & Vine, a vegan restaurant in New Hope, PA. The chef/owner used to work at the now closed Horizons in Philly. 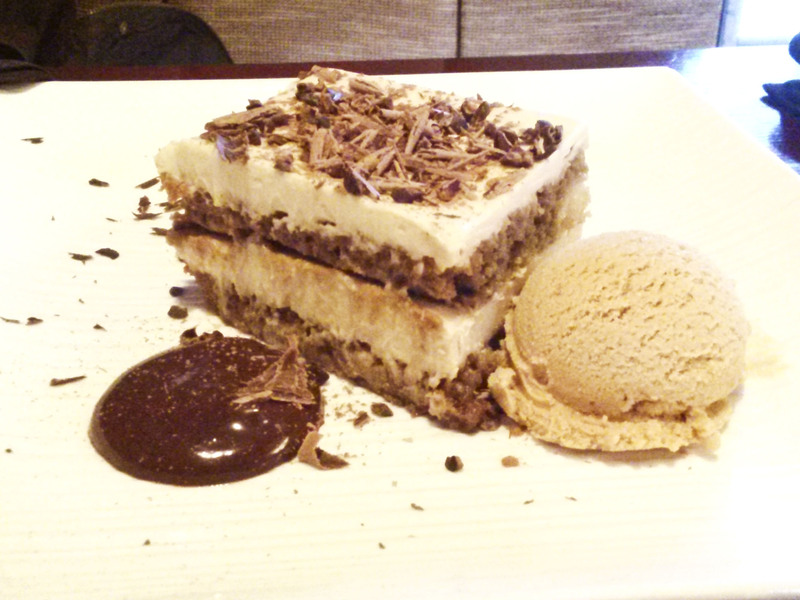 The atmosphere was nice – quiet and relaxed even though the food is fancy. They have a lunch, dinner, and brunch menu. As tempting as brunch was, we decided to go for dinner. 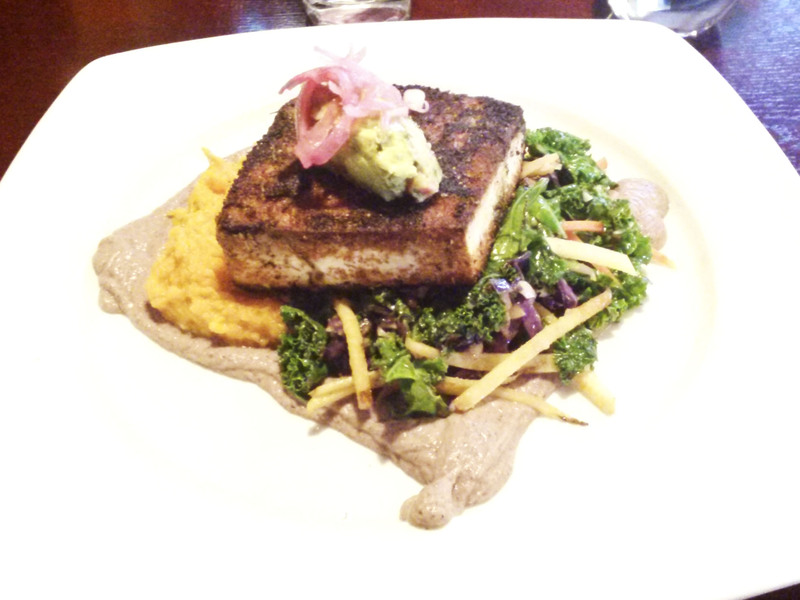 I ordered the blackened tofu, and it was really yummy. It came with sweet potatoes mashed with coconut (milk, I think). It’s not a combo I would have thought of, but the flavors really work well together. 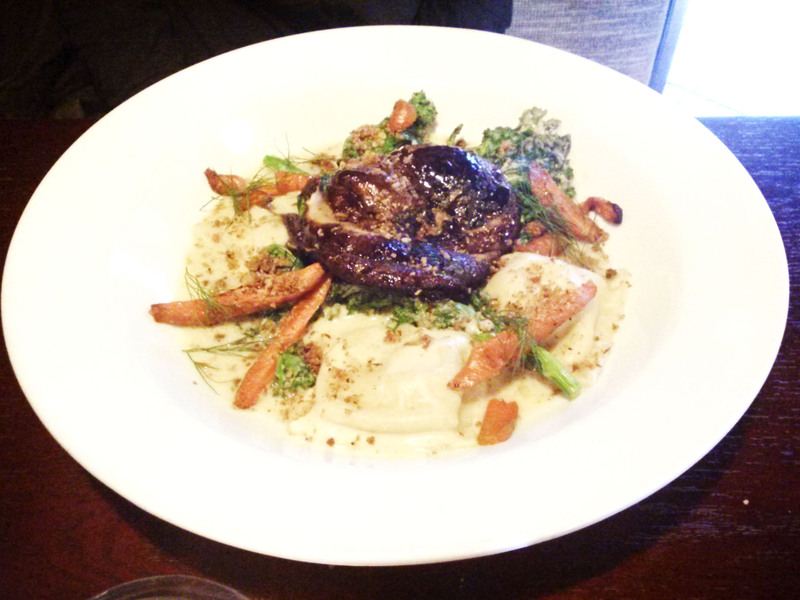 Laura got the Parsnip and White Sweet Potato Ravioli. As good as my tofu was, I think the ravioli dish was the star of the show! The ravioli filling has a lot of fennel in it giving the ravioli a slight taste of licorice, which we both really liked. The cashew cream sauce was really good as well. Try as we might, we couldn’t leave without dessert! We don’t eat out at restaurants much any more, so we decided to treat ourselves. Laura got vegan tiramisu, which was really good! I love tiramisu and haven’t tried making a vegan version yet. 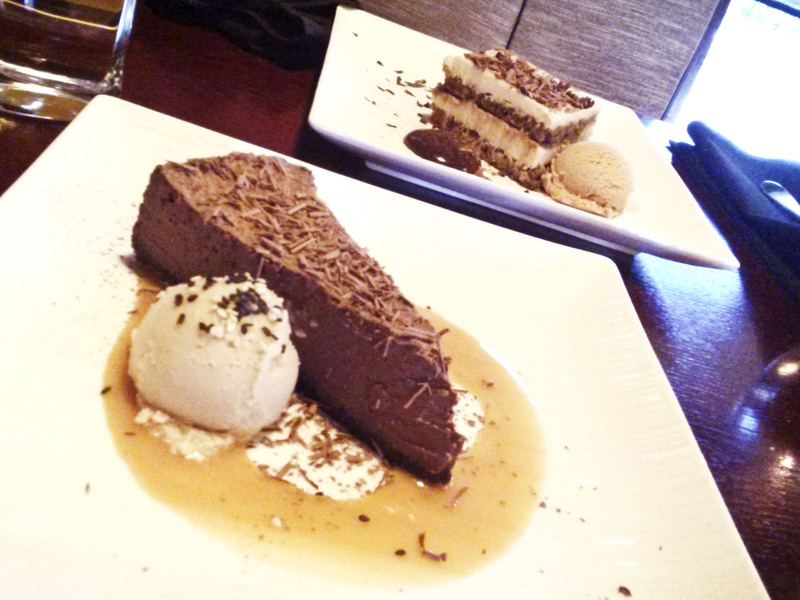 I ordered the Chocolate Mousse Pie with a black cocoa crust which turned out to be my favorite. It came with a little scoop of sesame tahini ice cream and was drizzled with salted caramel. The mousse was smooth and creamy and not overly sweet. The salted caramel added a little extra sweetness and saltiness. And the caramel with the sesame ice cream was a really amazing combo. Sesame is one of my favorite flavors, and I don’t know why I never thought of making sesame ice cream before! I will definitely have to make this at home. It was a great way to celebrate our birthdays! We’d been wanting to go for a while, and it was really worth the wait. If you find yourself in New Hope, you should definitely give it a try! This entry was posted in Restaurants and tagged blackened tofu, chocolate mousse pie, dessert, ice cream, New Hope, New Hope PA, PA, Sprig & Vine, Sprig and Vine, vegan ravioli, vegan restaurant, vegan tiramisu. Bookmark the permalink. ← Mother’s Day Sale – Free Shipping on Pendants at The Creative Kat Etsy Shop! Oh we’ve been to Sprig and Vine too! It’s delicious!! I guess we’re not quite an hour away (in the Reading area). New Hope is a fun spot to visit. Wow, this all looks beautiful! I can never pass up the opportunity to order vegan ravioli when I see it (which is not often) as it was my favourite food as a child. And oh my gosh, those desserts sound to die for! What a lovely feast for birthday celebrations! It was really nice! I’ll have to go back for brunch sometime. They have a beet lemonade that I didn’t get to try, but it reminded me of your potluck challenge!